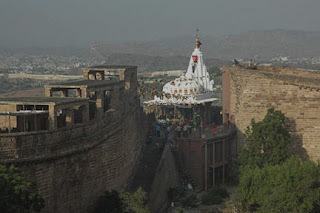 The Chamunda Mataji Temple in Jodhpur, Rajasthan is located in the southern end of the Mehrangarh Fort. Chamunda Mataji was the much loved goddess of Rao Jodha. In 1460, he brought her idol from the old capital of Mandore in 1460. Then, it was installed in the Mehrangarh Fort. Till date, the goddess remains the Isht Devi (the adopted goddess) of Maharajas and the Royal Family. During Dussehra celebrations, the Mehrangarh Fort is thronged by ardent devotees to get a glimpse of Goddess Chamunda Devi. More recently the temple has been in news because of the stampede during Dusshera celebrations when nearly 140+ people lost their lives.